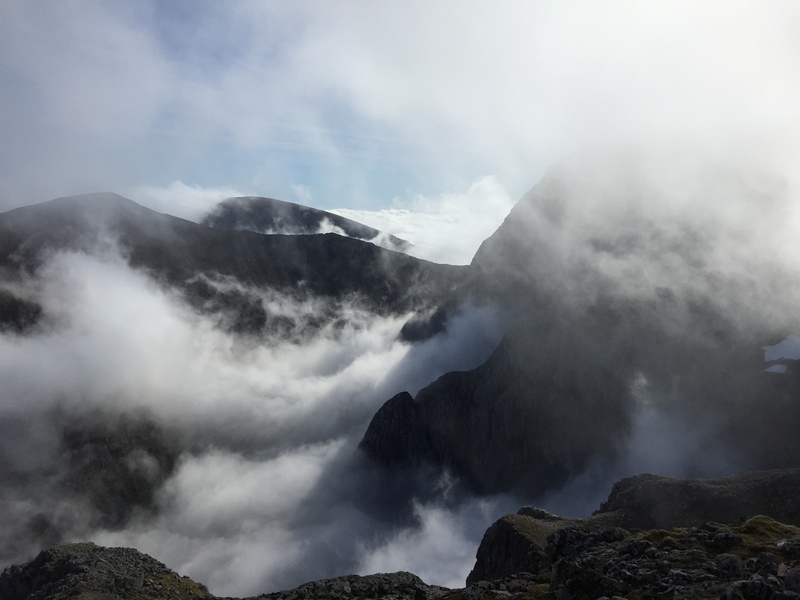 I had not been up the north side of Ben Nevis before. Last year around the same time I had gone up via the tourist route. In my defence I was with a friend and her young family, plus an American visitor so we were being just that – tourists! 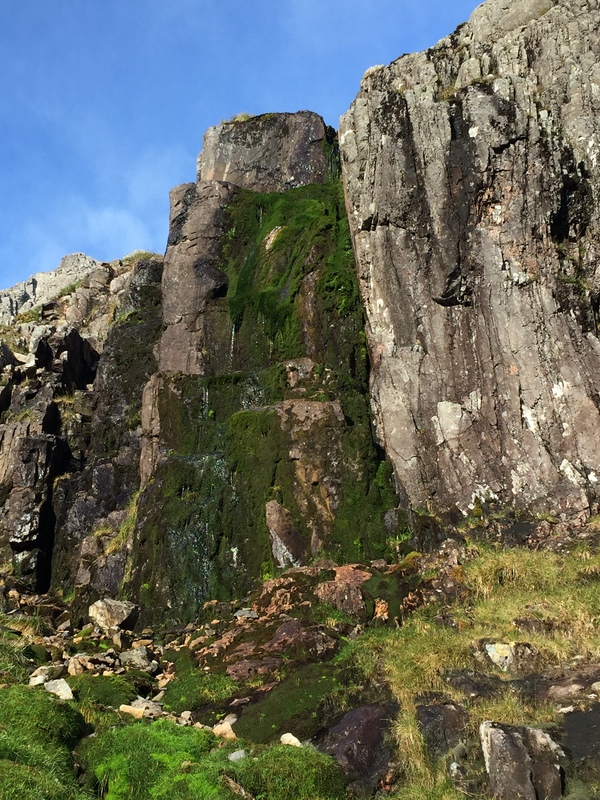 It actually turned out to be a really fun day and a different take on being out in the hills altogether, even though I wouldn’t have normally chosen that route myself. I drove down after work on the Friday night and met Raymond from the club at about 8pm at Torlundy so he could accompany me up in the dark. It was really kind of him, especially since the others had been up at the hut most of the day and he had the day off work. The walk in itself was magical. 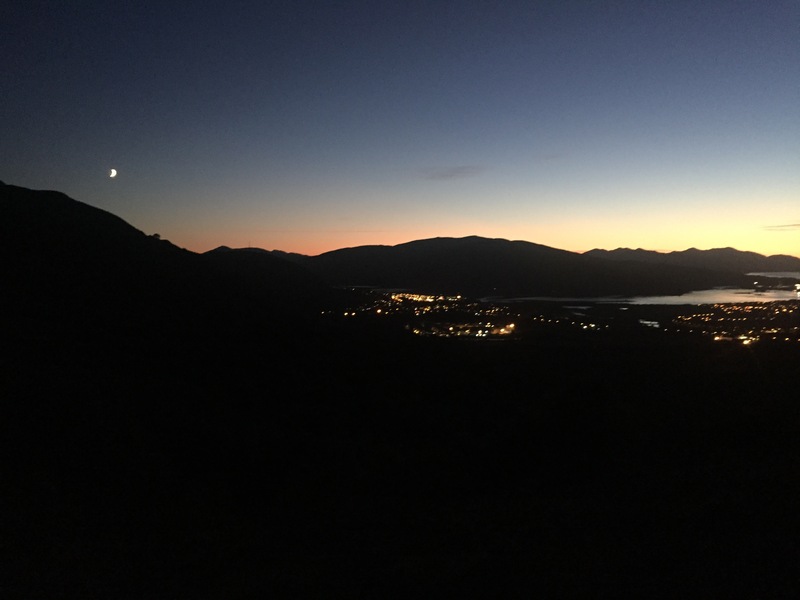 The drive across had been a glorious evening and sunset, and, coming out of Leanachan Forest, the western sky was bathed in a warm orange glow, with the Ben’s north face strikingly lit up in the moonlight, the lights of Fort William twinkling far below. 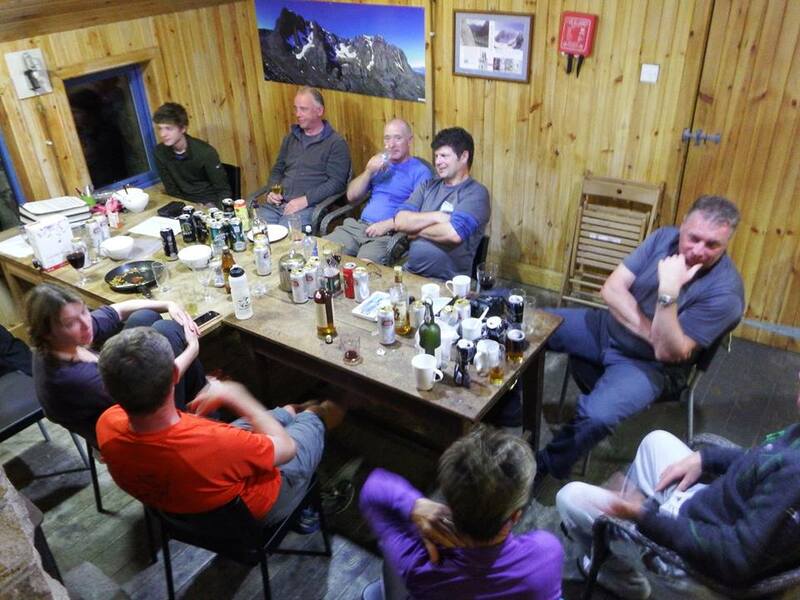 We swigged from a bottle of malt whisky on the way up, knowing that everyone up at the hut would have already had a good head start in that regard. 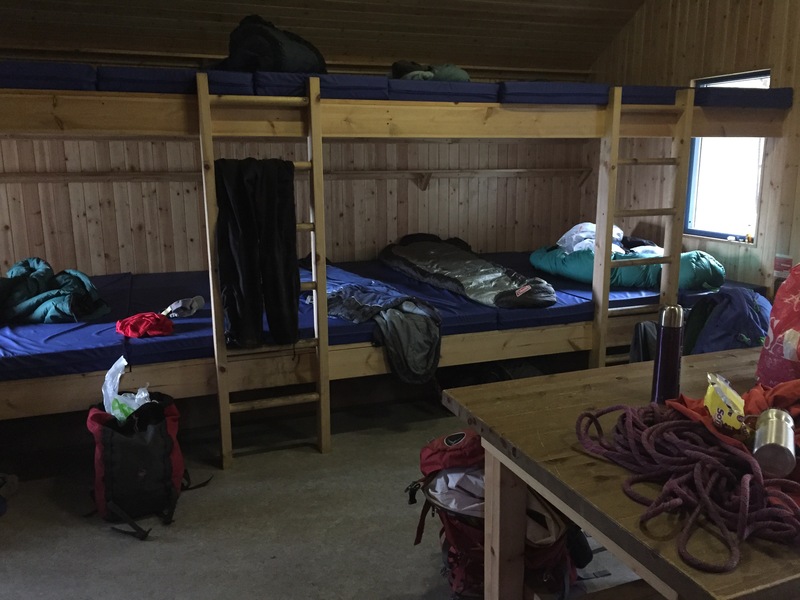 The hut itself is great and well equipped, and bigger than I had thought it would be, with a large separate sleeping room with alpine style bunks, and a living area / kitchen. We all had a good night round the table and were joined later by two guys from Aberdeen who also joined in the fun. 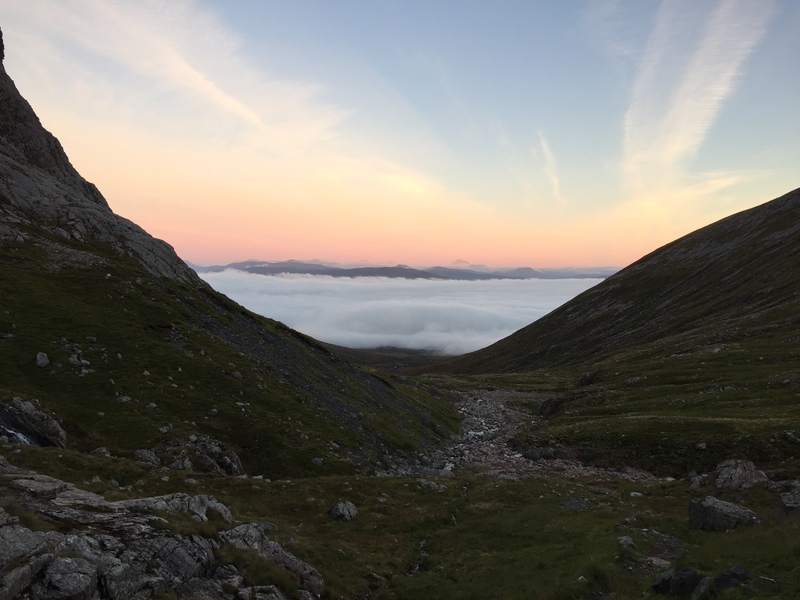 I got up early in the morning for the toilet and, as I glanced out the window, was amazed by the incredible pink sky and the cloud inversion creeping up the corrie. 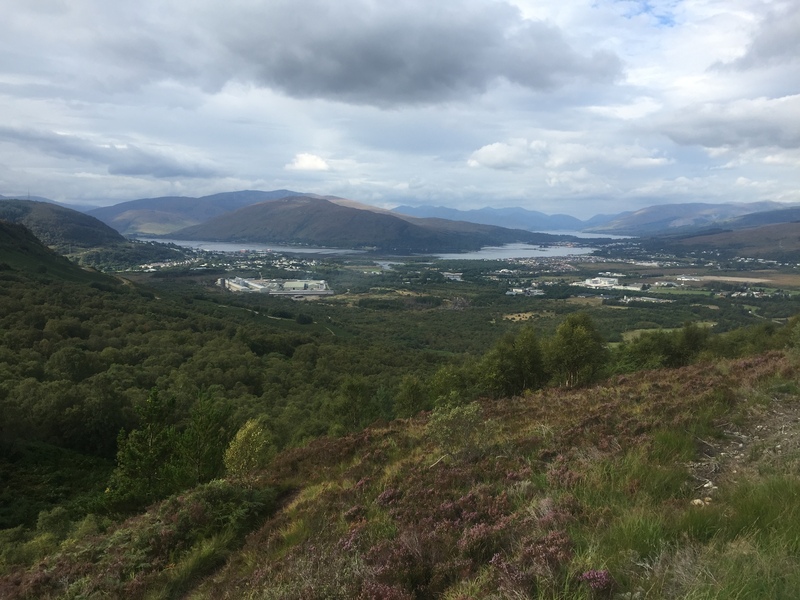 It was funny to think down in Fort William they would be in full cloud, while up here we were enjoying blue sky and full sunshine. 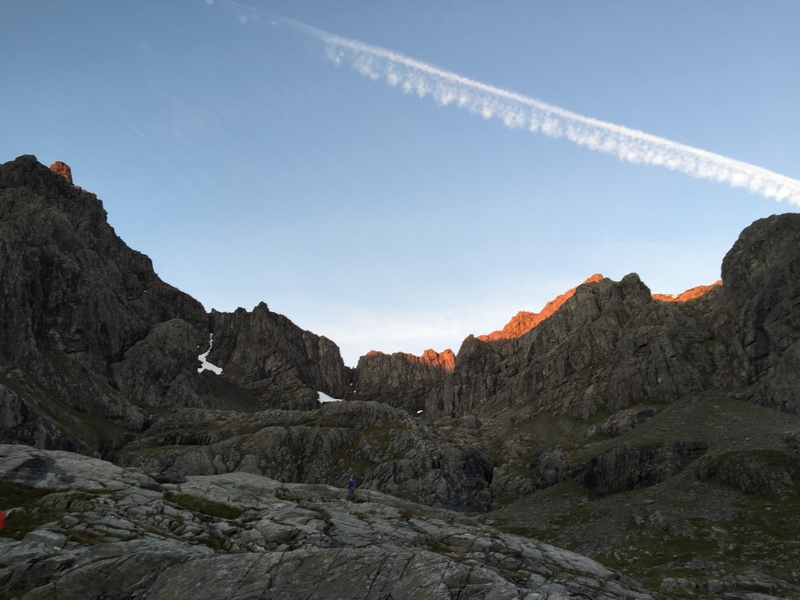 The sun was just hitting the very top of the north face – it was incredible. After that I could hardly sleep again. 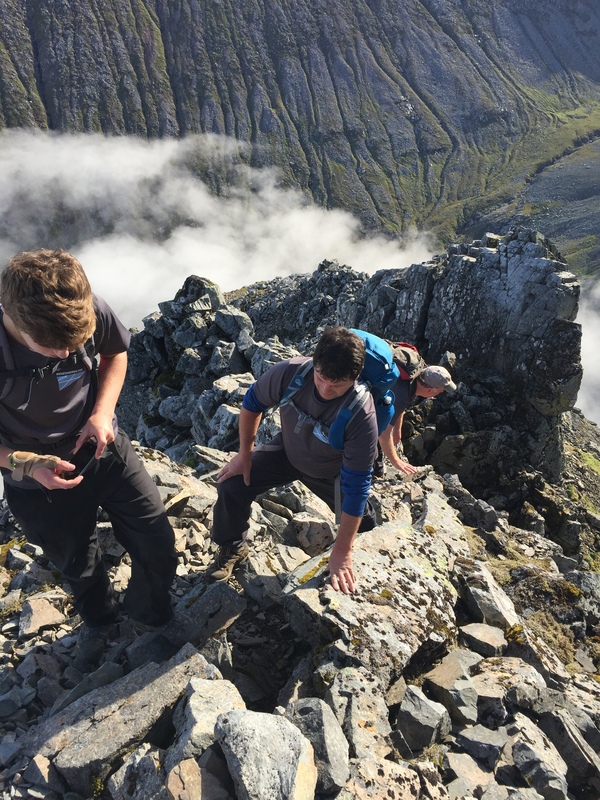 The Ledge Route had been unanimously chosen as the day’s route, along with the Carn Mor Dearg Arete and then straight back down from Carn Mor Dearg to the CIC Hut. I literally could not wait! 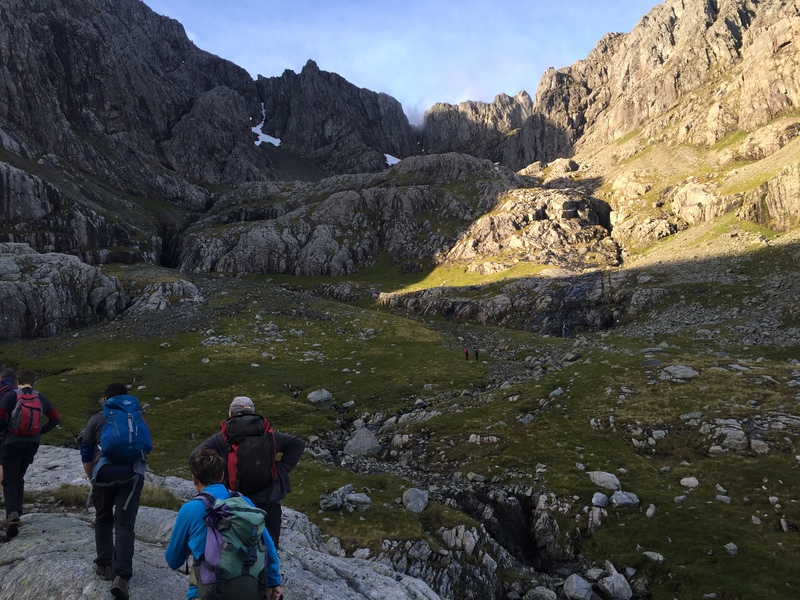 We started out by crossing the slabs from the hut across to No.5 Gully. The excitement was palpable. We clambered up the gully until we came to the ramp on the right hand side. 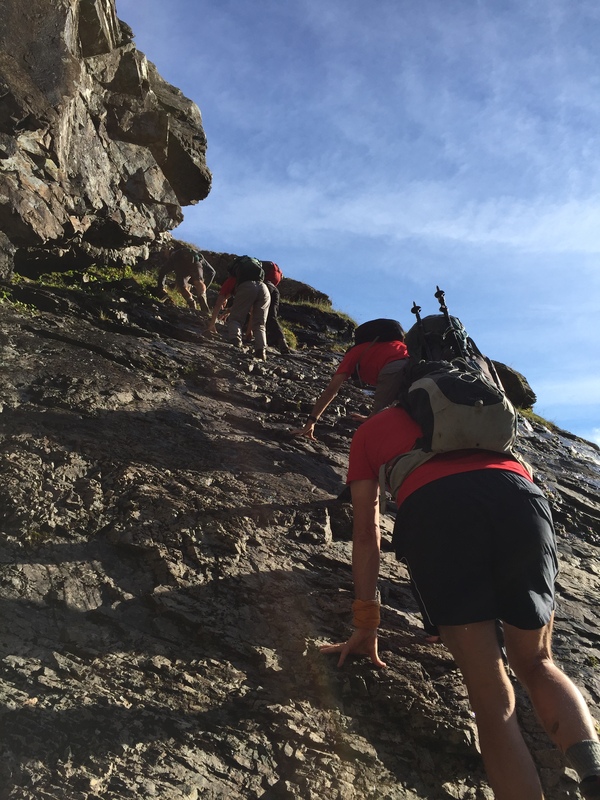 This was probably the hardest part of the whole scramble, being lacking in holds and bits to put your feet. Any slip here could be fatal, but at least the rock was fairly dry. I scraped myself up in a very ungainly fashion, relieved that bit was over. The rest was sheer bliss. 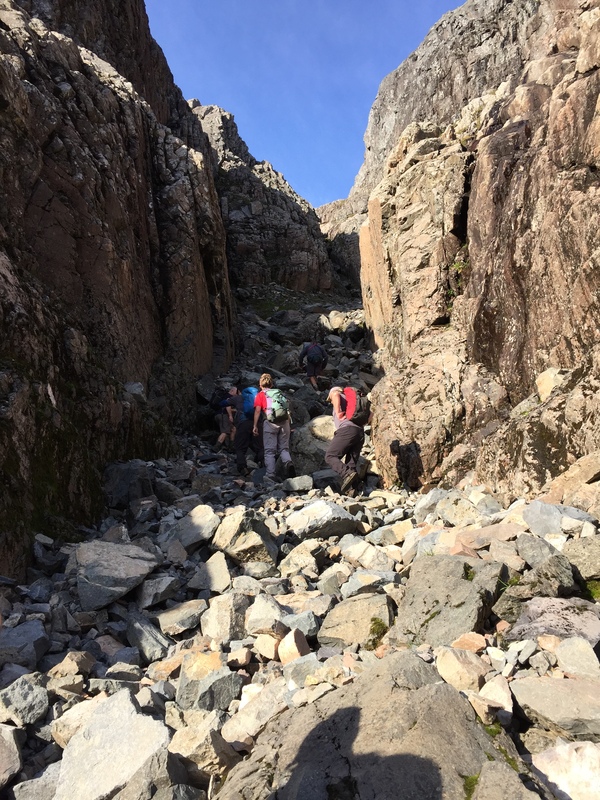 The scrambling was fairly easy, not technical at all with plenty of hand holds and steps. There was a bit of exposure but not so much that I felt it, although I tend to not look back down, and when I did it was shrouded in cloud which helped minimise it. There was one slightly tricky stack that took a while to haul up but apart from that it was fine. 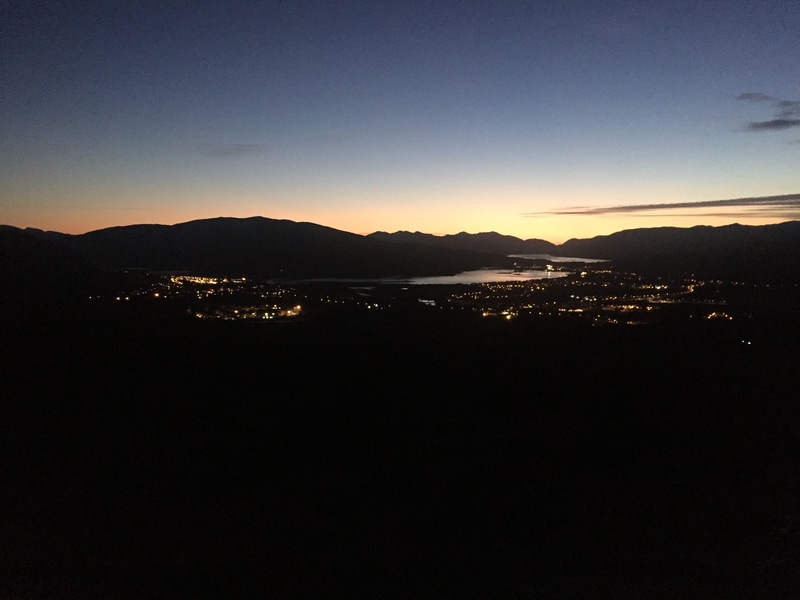 We stopped plenty of times to take in the views and our situation. It was just splendid. 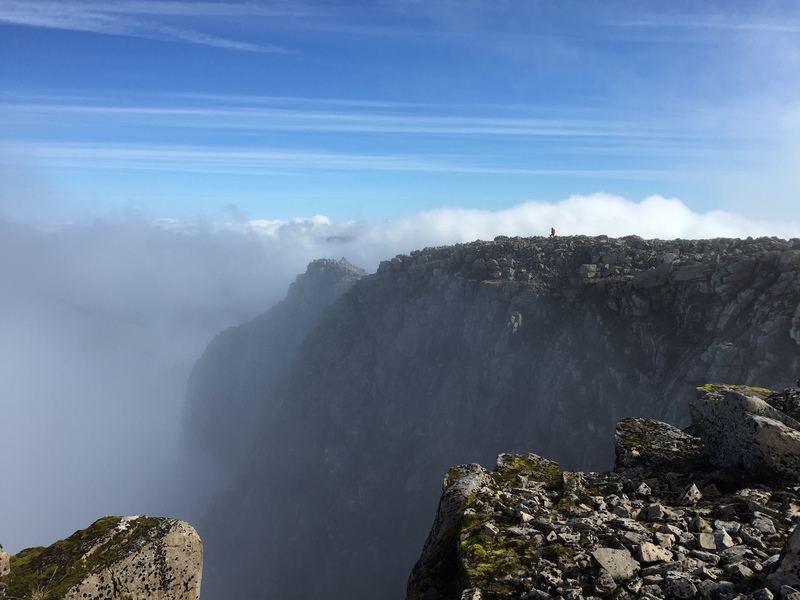 The mist was slowly creeping up the glen and we knew we would shortly be in the cloud, but the fact we had done the entire Ledge Route in such glorious conditions made me pinch myself that this was actually real. 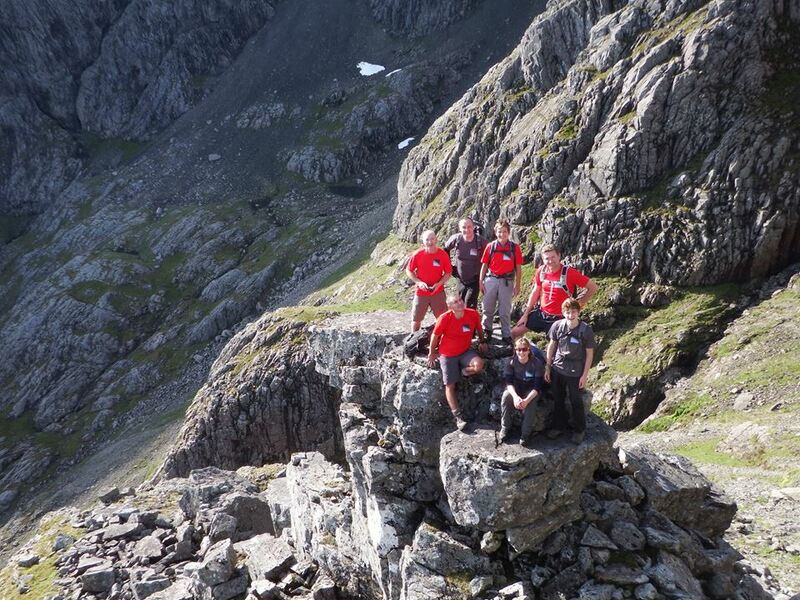 Plenty of posing – and Carn Mor Dearg behind with our descent route – straight down! 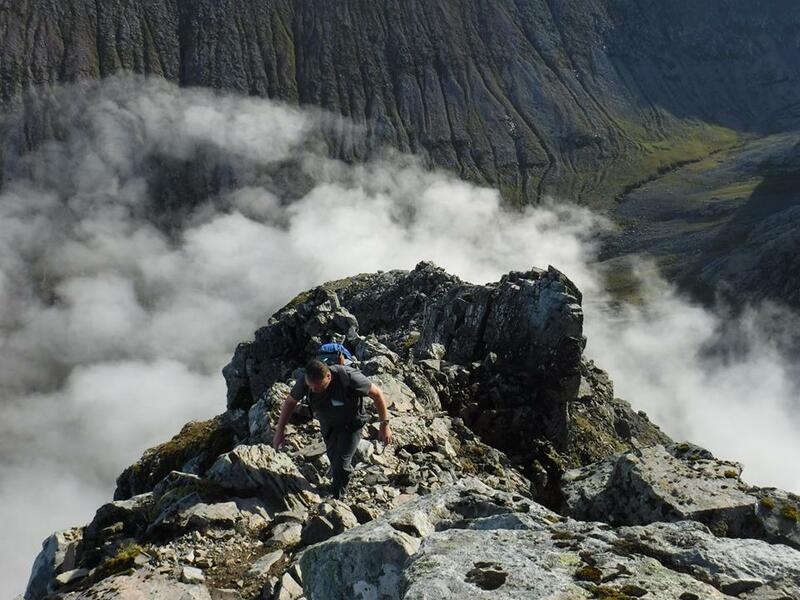 Eventually we came on to the summit of the top Carn Dearg, which joins the summit plateau and the main tourist path. 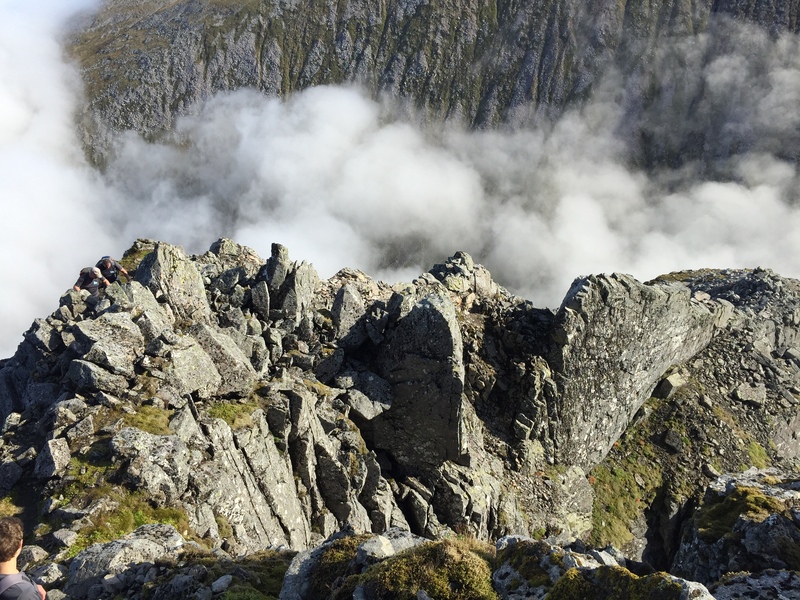 It was surreal to suddenly see crowds of people milling about looming out of the mist. We were very soon at the top of the Ben. 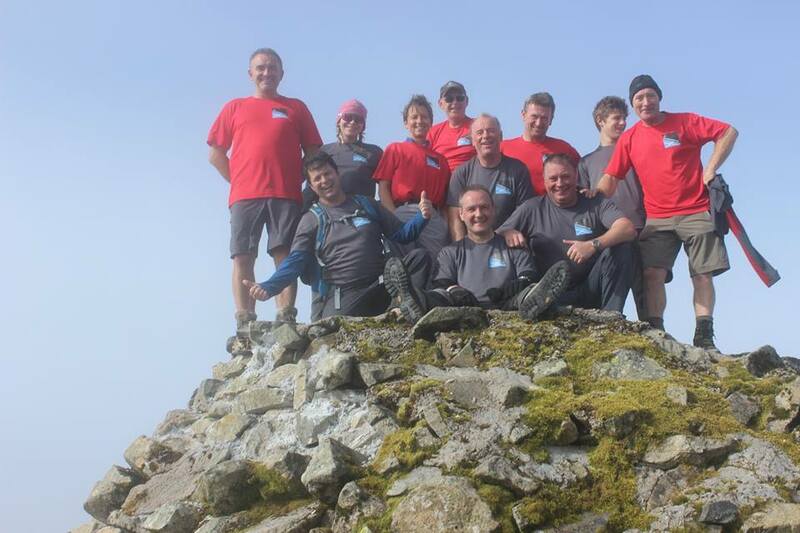 We got our group photo taken after queuing patiently at the trig point and then sat and had lunch. 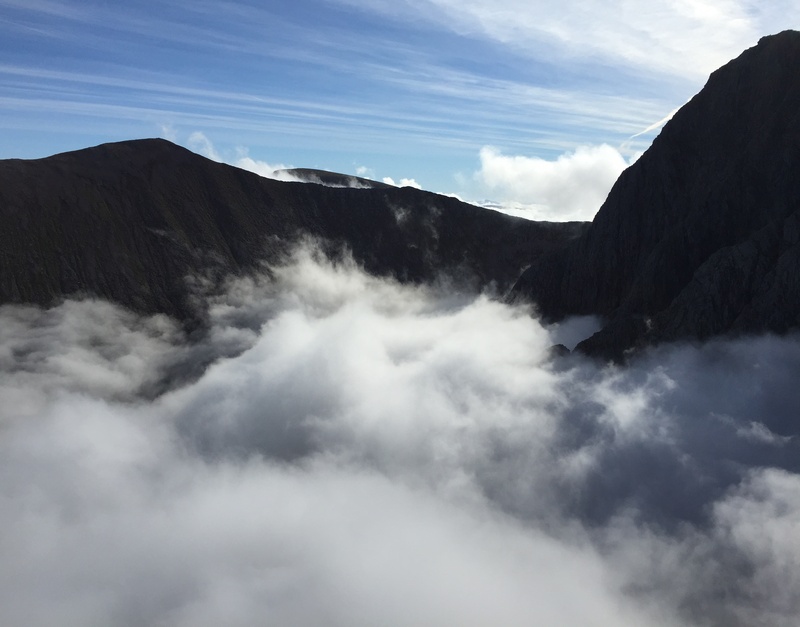 We set off towards Carn Mor Dearg and had only gone around 200 metres when the mist cleared and the sunshine and blue skies made a reappearance. 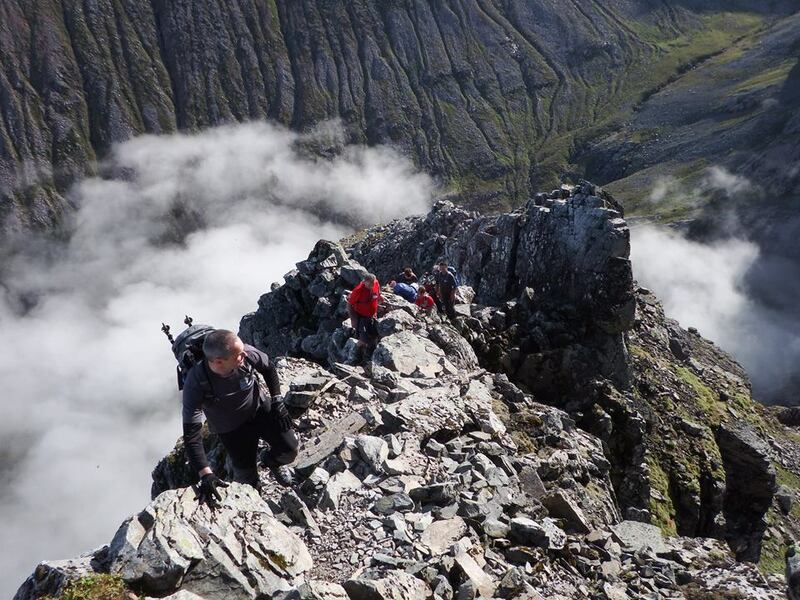 Half of the group decided to head back up to the summit, because how often do you get views from the top of the Ben? To be honest I wasn’t too fussed, but decided to anyway because I couldn’t be bothered waiting about and getting cold. 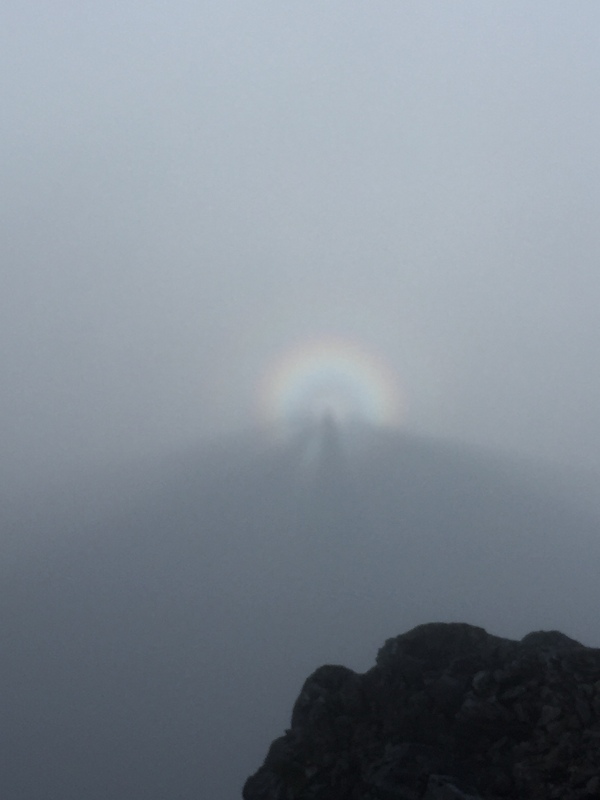 I was glad I did, because although the mist had returned by the time we got back up, we were treated to a fantastic Brocken spectre from the summit. I have only seen this once before, from the South Shiel Ridge. 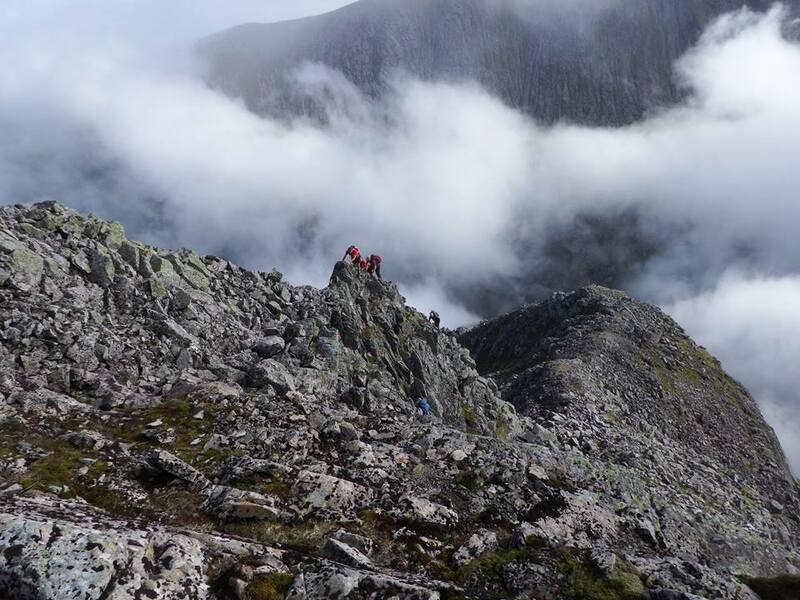 The way down to Carn Mor Dearg was on tiresome boulders which slowed me down, but the arête itself was great. Mindful of a recent fatality from here, I was very careful because I was starting to get clumsy for some reason, and kept having mini stumbles. 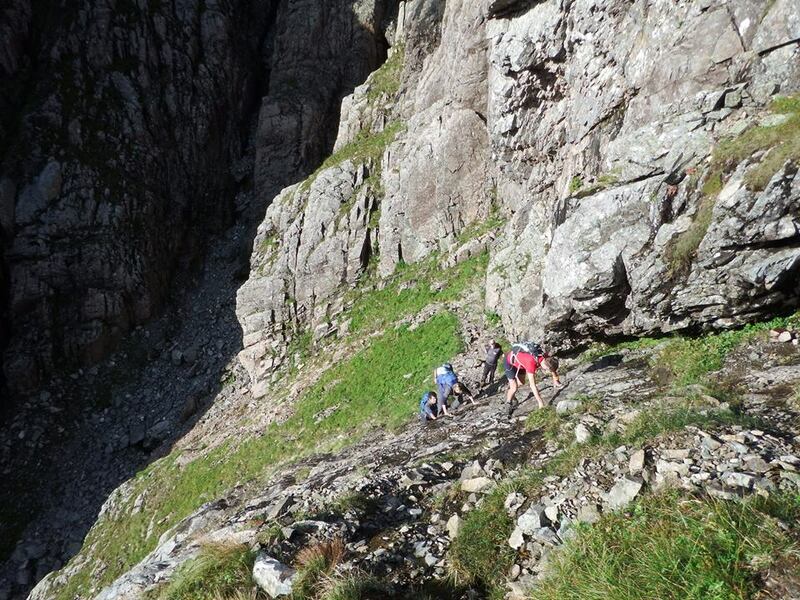 At one point the ridge got terrifically narrow and I edged across with legs either side! 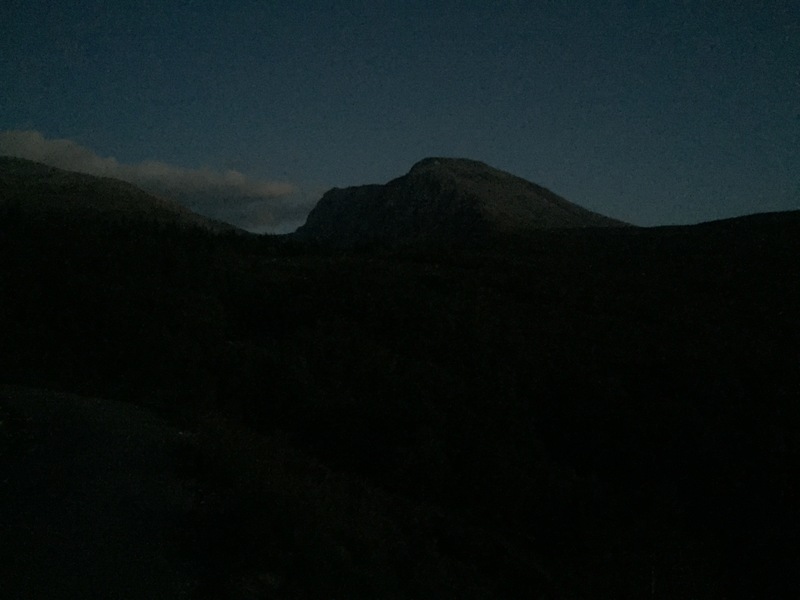 We were too soon at the summit of Carn Mor Dearg, and realised we had only been going for five hours. For such an epic route, it felt much longer. The route back down was straight down the steep sides to the hut. This took me longer than I thought because the ground was covered in potholes with wet slippery grass, and I fell countless times. I was in no rush though – it was only 3.30pm by the time we were all back at the hut. 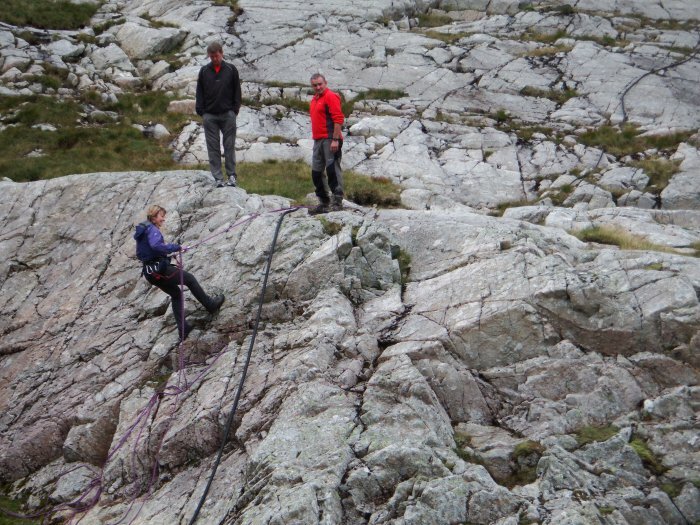 Later on we did some abseil practice on the rocks outside, which was great fun. Although I clearly need to work a bit on my technique..
After that it was another brilliant night of singing and banter, ensuring that the walk back out to the carpark the next morning was far more subdued than the way in. 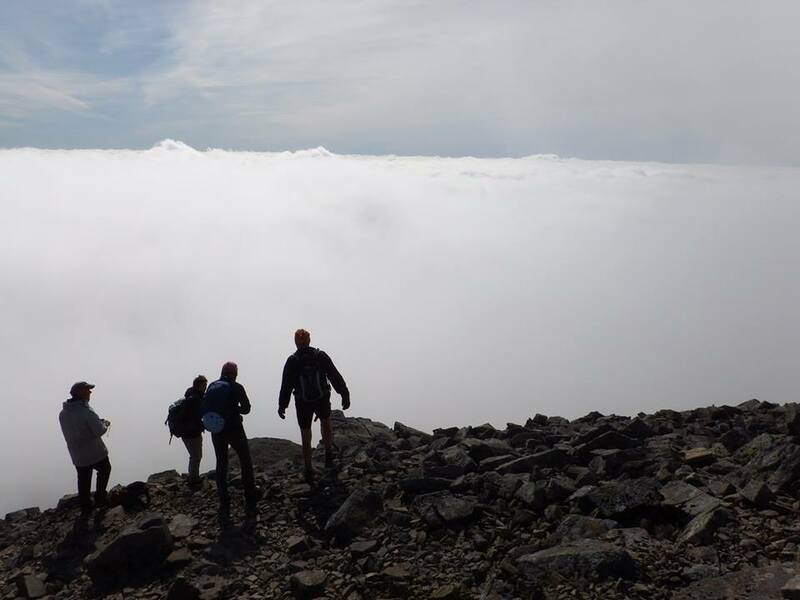 My plan to walk up Gael Charn on the Sunday was swiftly scrapped – the high of the rest of the weekend had been more than enough. Brings a smile to my face re-living that weekend. 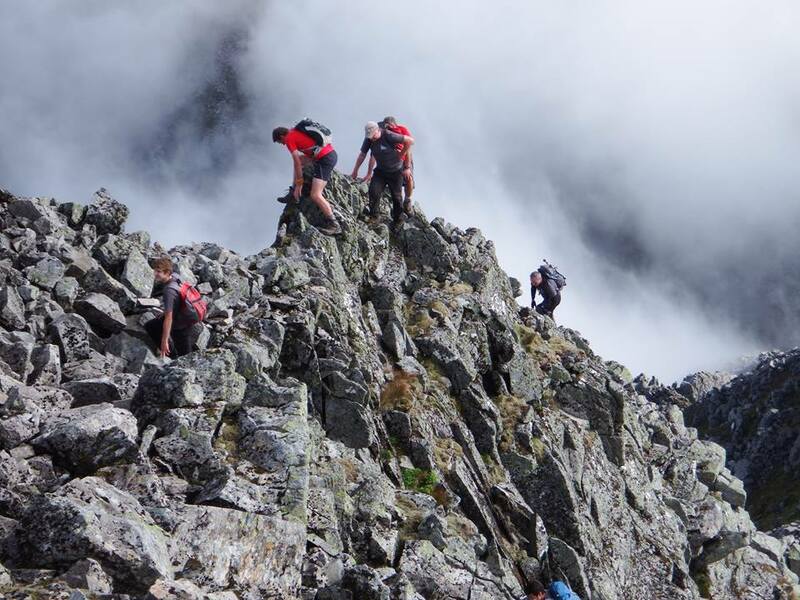 Fairly jealous of that day, although I’m pretty sure I’d have wanted a rope handy in case I got panicky on some of those bits – I think you’re pretty brave doing all that just with the group – I’ll probably hire a guide if I ever do it. I chickened out of the CMD once when out with Richard as I thought the bit ‘around the corner’ looked nasty and I wasn’t enjoying it up to the corner anyway (going the other way) – turned out the bit around the corner was fine so I wished I hadn’t. I’m slightly braver now so could probably do the CMD but that ledge on the Ledge route looks pretty scary and it’s narrower further up than I thought. Great photos though – best I’ve seen of the Ledge Route so far. 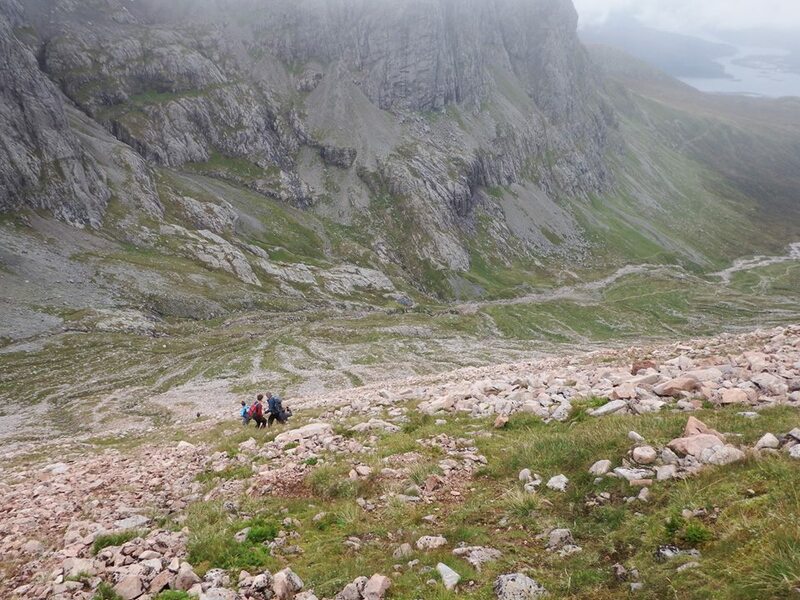 There’s no way I’d have accompanied the group straight down the side of Carn Mor Dearg – I’d have walked to after the 3 peaks of it and gone down the steep grass instead on my own. Also jealous of your stay in the CIC hut! 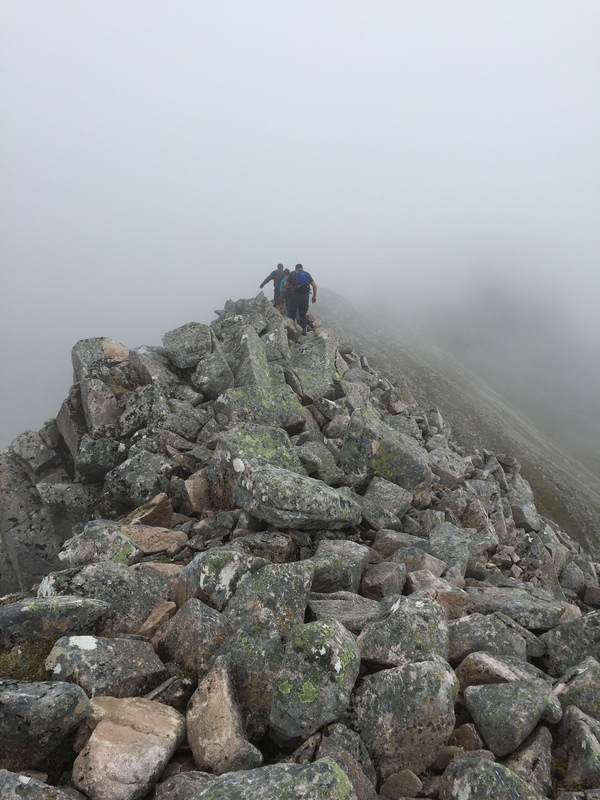 I actually planned to do just that after Carn Mor Dearg – when the descent was pointed out opposite I said there was no way I was dropping down that and I would be going along the ridge, down, then back up to the hut. But when we peered down the side it didn’t look half as bad as it did from opposite. I mean it was very steep, but not completely vertical. The CIC Hut was really special. We were all sat round an old table apparently built by the climber Raeburn 100 years ago. Whether that’s true or not – I can’t find any information about it but I was in awe at the time. I’m sure I’d be okay on both routes but would definitely want someone experienced and the option of a rope if necessary! I know, the sense of history was brilliant, quite awe inspiring. Many of the guys in the club are experienced, one of them had done lots of climbing round the north face so I felt in safe hands. If they hadn’t been, it would have been a different story. Other people having more experience means everything to me on a route like that. I think that’s the trouble when just me and Richard go somewhere – although he’s braver and will go and have a look ahead for me etc. he’s much less experienced and, at the back of my mind, I know it’s me ‘running’ the walk and route etc (if you get what I mean). Yes me too. 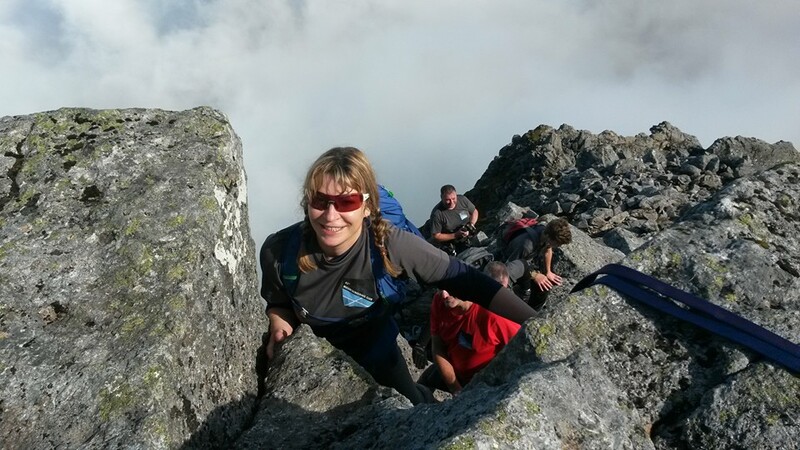 It’s partly why I joined the club – to have the chance to do stuff like this with more experienced members. You should join our club 🙂 It’s a national one – you’d be more than welcome! Hahaha I think he would smile to hear that 🙂 No don’t think he is either. Not sure where you may have heard of him…unless some of his exploits have travelled! I’ve most definitely heard of him – and I think read some stuff of his – wonder why – you’ll have to ask him about that! It’s funny – there was a bit of exposure but I put it out of my mind and concentrated on finding good hand holds. It wasn’t until we turned around to look back I couldn’t believe what we had scrambled over! You got a grand day for it. Any Gael Carn would be a serious anticlimax after an outing like that. I’ve only done it the once, on a fine day in mid July. There was still snow in number 5 gully and the sloping shelf was very greasy. It was a long day as we did the other of the Bens’ Top and CMD. No high starts for us, we slogged it up from car park. I don’t think I would be too happy on that shelf if it was greasy – not many places to grasp of you start slipping! 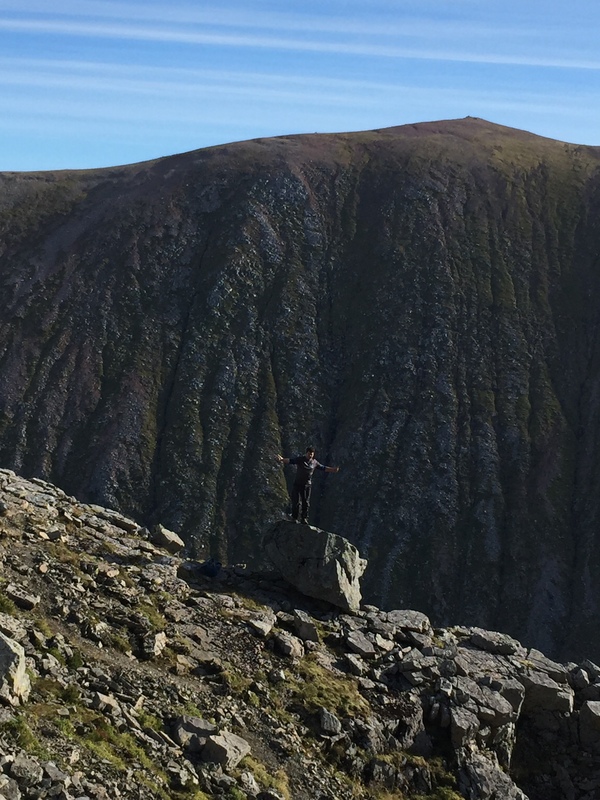 Yes, that’s what I thought re Gael Charn – it wouldn’t have added to the weekend at all. Plus a long drive home and feeling hungover too – it wasn’t going to happen!